Turles is a Saiyan and the primary antagonist in the Dragon Ball Z movie special, The Tree of Might. He was once a member of the Saiyan Army under the Planet Trade Organization, but went defunct and off into the cosmos to conquer planets for himself. His first appearance was in the third Dragon Ball Z movie and the second was in the two-volume VHS O.V.A. released as a "Official Visual Guide" for the Bandai NES game, Plan to Eradicate the Saiyans. Aside from a different skin tone and two "devil horns" in his hair, Turles looks exactly the same as Goku. In the Dragon Ball Z: Anime Film Comics, it was stated that the reason why Turles and Goku looked alike is because within the low-rank Saiyans, the facial patterns of each warrior were similar, thus making it easy to mark which Saiyans were low-class warriors. However, Turles said that Goku was "low-class trash", implying Turles may not have been a low-class Saiyan after all. 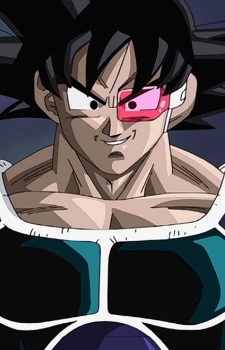 Though, he bears a resemblance to Bardock, Goku's father. Turles is a Saiyan warrior and former servant of Frieza. It is assumed that Turles escaped Planet Vegeta's destruction because he was on a mission. Nearly thirty years after Planet Vegeta's destruction, Turles, along with his squad of henchmen, make their way toward Earth to check up on the Saiyan, Kakarot (Goku). Turles' name is a pun on the vegetable "lettuce". The name is written out as ターレス, Tāresu. If the first two syllables are rearranged, it becomes レタース, retāsu. Ignoring the elongated "a" sound, it becomes the accurate Japanese spelling of "lettuce", レタス retasu.